State Rep. Carl Gilliard from mike O'Neal on Vimeo. ATLANTA – State Representative Carl Gilliard (D- Garden City) today announced that the Georgia House of Representatives gave final passage to House Bill 79, or the “Blind Bill,” on Tuesday, April 2. This measure would prevent government agencies and local authorities from discriminating against parents and legal guardians who are blind. House Bill 79 seeks to prevent discrimination against blind citizens while protecting the best interests of children that are parented by blind individuals. This bill would prevent courts, the Department of Human Services and any child-placing agency from denying child placement, custody, visitation, guardianship or adoption to an individual because the individual is blind. Further, the bill would mandate that the Department of Human Services circulate and implement these new rules throughout the state by the end of the year. For more information on HB 79, please click here. Representative Carl Gilliard represents the citizens of District 162, which includes portions of Chatham County. He was elected to the House of Representatives in 2016 and currently serves on the Appropriations Subcommittee on Economic Development, and on the Insurance, Interstate Cooperation, State Properties and Transportation committees. He is also a member of the Working Group on Creative Arts & Entertainment. 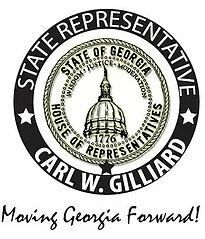 ATLANTA – State Representative Carl Gilliard (D- Garden City) today announced that the Georgia House of Representatives adopted House Resolution 48 on Tuesday, April 2, to oppose offshore drilling and seismic testing along Georgia’s coast. House Resolution 48 seeks to protect Georgia’s coastline that stretches over 368,000 acres of saltmarsh and provides local fishing and tourism industries. The resolution opposes drilling activities that could result in spills, which could have long-term, detrimental effects on Georgia's fishing and coastal tourism industries. The resolution also recognizes that the practice of offshore drilling requires onshore infrastructure, such as pipelines or refineries, and seeks to prevent unwanted changes to Georgia’s coastal landscapes and communities. For more information on HR 48, please click here.